Save US$ 150 at Joomla World Conference 2014! Just want to tell you there will be a great Joomla festival this November in Cancun, Mexico. Yeah, you've heard it right. Joomla! World Conference 2014 (JWC14) will be held in Cancun between November 7 - 9. This will be final chance this year to meet all the interesting Joomla folks and have amazing time with them. Best of all, having the party on with some truly adventurous Joomla guys, those who are courageous enough to be there at #jwc14, while others sit at their desks and dream on. 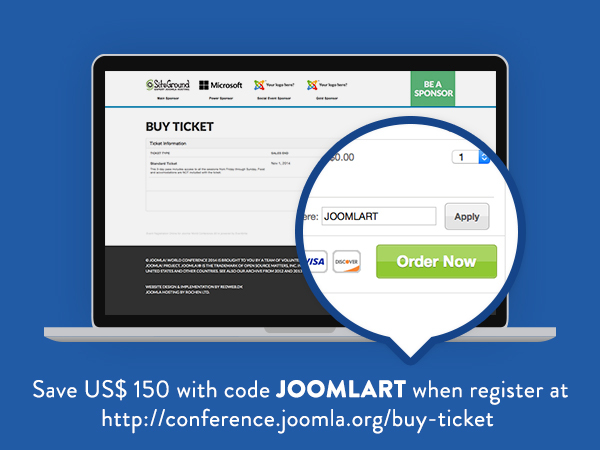 So take our code JOOMLART upon registration via http://conference.joomla.org/buy-ticket, at your own risk. And let get loud! Don’t forget to tell us @joomlart what you do there at #jwc14.